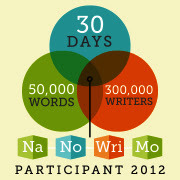 So, it’s September now and I’ll be starting to put up a list of interesting and helpful articles for NaNoWriMo 2012. You can always add a comment at the bottom here to add a link to this list. I will probably also write a couple of blogposts and I might check out some links that people have shared. These are my posts from last year, ranging in subjects from how to keep track of your wordcount, how to keep motivated and also bits of my own rambling. Below I will list links to programs, websites, blogs, anything that can help you through writing and planning and all the stress of NaNo. yWriter (free) this program is created by Simon Haynes, a writer himself. This program works really well with doing NaNoWriMo as Simon is an avid participant too. FocusWriter (free) simple program that is really handy because it can hide all your background and you can choose the colours all yourself. Very little to distract you. Scrivener (not free) Great program to use, it has a lot of options and if you take a couple of days before NaNo to figure it out you should have no problem with it. Free Scrivener Templates, covers a range of plotting and organising techniques and templates for them to use in Scrivener, haven’t used it yet but seems promising. Hailstorm Approach, this is a quick and dirty shortcut for the Snowflake method, which is a plotting method, for when you really run out of time. Notecarding, a very handson method for planning and laying out your novel. Holly also has other great articles like guides on creating characters, worlds and other things. She is one of my fav go to places to find information on writing. Snowflake method, a very thorough guide that can help you create a full fledged novel outline in some interesting steps. This year I wrote 3 blogposts about different parts of writing, nothing technical but they were all things that I only figured out after years of writing and reading a lot of other people’s work. They cover a range of writing conventions and simple tips. They were originaly written with people in mind that focussed mostly on putting their stuff on websites like FictionPress and Booksie. Articles on Writing by Simon Haynes. The creator of yWriter also writes great articles on writing. Rebecca Blain – National Novel Writing Month Deals with the question of what NaNo is and why and why not you should attempt it. Dominic Ross – A Newbies 10 tips to completing NaNoWriMo Some great tips that Dominic wrote down after completing CampNaNo this year!